Today's quick and dirty recipe was a Good Food special. I've been so busy pondering the Olympic Food Challenge (OFC) and researching my nineteen recipes that I forgot that I had to cook something different today. And then I forgot that I actually have to blog about it too. I've heard the rule of thumb for learning to do something is that you have to do it twenty times before it becomes habit. I've done this 306 times. You'd think it would be second nature by now. And whilst I was busy neglecting the regular blog for the OFC, I also failed to note that it starts tomorrow and not on Thursday. B*gger! I had what I needed for tomorrow's recipe which was going to be a rhubarb crumble cake and I was going to start on Thursday with a dish from the Solomon Islands. I've now had to reshuffle things and will be making a souffle tomorrow - cue manic panic because I've been strategically avoiding that one all year. Tuna and papaya salad on Thursday. Rhubarb crumble cake? Well let's just say that I may not be getting good feedback from my boss at my mid-year review now. Ah well. So the blog is going to be short and sweet tonight as I go into panic mode. I picked this recipe up from a chicken recipe book that came with Good Food this month. It's also been languishing in my binder on the Good Food website for over a year as something to make in an emergency on a hot sunny day. It ticked all the boxes today. Some of the reviews weren't great so based on advice, I added some garlic to the courgettes while they were cooking and with the lemon and lots of seasoning, I could've just eaten a massive pile of them as they were. That would actually work really well as a low carb alternative to spaghetti if you grated them lengthways (as I did) rather than across the round end. Sprinkle on a few parmesan shavings and you'd have an ace, low-fat, low carb meal. 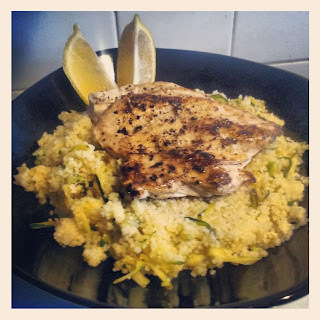 With a pile of well seasoned couscous and a well seasoned chicken breast, this made a quick, simple tasty meal that I will definitely make time and again. I even got Miss A eating chicken today by telling her it might just turn her into a butterfly (yes I do own a copy of Great Lies to Tell Small Kids although that's not in the book). Couscous wasn't proffered because even the dogs are rubbish at cleaning that off the floor and I wasn't in the mood to clean up. Hubby doesn't like couscous so this is definitely one for me and me alone but I'm happy I have something healthy and low fat that I can quickly cook alongside other meals.